Since 1998, the author has published a good deal about his research into the disadvantages of bits and the advantages of bitlessness. Six articles in scientific journals and a further 10 in horsemen’s journals have compared and contrasted the bit with the bitless method of communication. In addition, independent authors have published a further 27 articles on the bitless method, in horsemen’s journals around the world. The present article has three objectives. First, to provide a foundation bibliography on the new bitless method. Secondly, to present additional material in a format that can be understood by both veterinarians and non-veterinarians. Thirdly, to publish a questionnaire that enables riders to compile a behavioral profile of their horse when ridden with and without a bit. The first part of the questionnaire alerts a rider to 105 problems that the bit may be causing their horse and themselves. The second part documents which of these problems the bit was causing. The questionnaire is based on a series of yes/no answers to the presence or absence of 105 adverse behavioral problems that the author now recognizes as being caused by the bit. In the last five years, all these problems, in many different horses and for many different riders, have been eliminated by removal of the bit (Cook 2003). Riders who banished the bit have discovered that they owned a much better horse than they thought. Elimination of bit-induced problems enhanced the welfare and performance of their horse and made riding simpler, safer and more satisfying. The article is in three parts, reflecting the three objectives. Man has underestimated the harmful effect of placing one or more metal rods in a horse’s mouth (Cook 1998a, 1998b, 1999a, 1999b, 1999c, 2000, 2001a, 2001b, 2002a, 2002b, 2002c, and 2003) [The texts of the full references are available at www.bitlessbridle.com. A complete reference list of all the articles that have been published about the new bridle is also available online]. Though all horsemen are familiar with the phrase 'aversion to the bit', if they were asked to compile a list of the problems that make up this syndrome they would probably have difficulty in thinking of more than half a dozen. Yet the author recognizes 95 problems that affect the horse and at least 10 more that affect the rider. It has only been possible to recognize this number since the recent development of a bitless bridle that differs entirely in concept from the traditional hackamores, bosals and sidepulls. The ease with which a horse can be switched, overnight, from its regular bit to the new bitless bridle has served to highlight many problems that had not previously been recognized as being caused by the bit. Essentially, this has constituted an unprecedented opportunity to conduct a large-scale controlled experiment. Early bits were probably made of plaited rawhide, wood, bone, and horn, but metal was quickly adopted as the norm. Sadly, the bit method of communication has survived through the Bronze Age, the Iron Age, and into the age of stainless steel. The simple bar snaffle has been followed by the jointed snaffle and design has become more ingenious with the curb and chain bit. As one bit has often been considered insufficient, two bits are frequently used, as in the double bridle and other examples. Leverage bits (i.e. curb bits) logarithmically increase in the mouth whatever pressure the rider applies to the reins. The pressure is applied to the jawbone at the bars of the mouth (Fig 2). The diagram is drawn to scale and the section is viewed as though the reader is standing in front of the horse, looking directly into its mouth. The diagram is based on measurements taken from the skull of a larger than average horse, yet the bars of the mouth are only 29 mm (1 1/8 th inch) apart. For illustrative purposes, the shank of the bit is shown at 90° to the line of the lips. In practice, it should never achieve more than a 45° angle but this discrepancy does not affect the principles of action discussed below. The curb bit illustrated has a 10 cm (four-inch) mouthpiece, 12.5 mm (half-inch) diameter cannons, a mild port, and a two-to-one ratio between a 5 cm (two inch) cheek bar and a 10 cm (four inch) shank. As curb bits go, this is regarded as a mild curb. The mouth is illustrated in a slightly open position, with the lips just parted. In a double bridle, the bradoon bit would lie on the bars above the curb and between it and the first molar tooth. For the sake of clarity, an air space is shown between the curb bit and the bars of the mouth but in use these would be in contact whenever the tongue is either behind or above the bit. Nevertheless, the bit does allow air into the mouth and so it is appropriate, though regrettable, to show air around the tongue and other places. 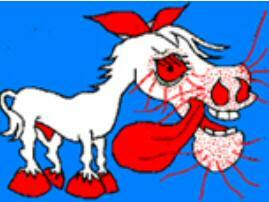 The tip of the tongue is shown ‘above the bit.’ This is probably the least painful position for that delicate sense organ. A horse has two other options. The first is to leave it under the bit. As the tongue is wider than the bars, this will be more painful, for the tongue will be trapped between the bit and the sharp edges of bone that constitute the bars. The second is to withdraw the tongue so that its tip comes to lie ‘behind the bit.’ This avoids tongue pain but causes the same bone ache as when the tongue is ‘over the bit.’ In addition, the root of the tongue now elevates the soft palate and this, together with the ingress of air in to the digestive part of the throat, obstructs the respiratory part of the throat. When the curb is centrally placed in the mouth, the port would prevent the cannons of the bit pressing directly down on the knife-edges of the bars. Instead, the cannons would tend to clamp and compress the jaw in a side-to-middle direction. In so doing they would pinch the terminal branches of the mandibular nerve as it exits the jaw at the mental foramen (Fig 2 and see also Part II; Fig 1). At any time when the curb is not symmetrically placed in the mouth, one cannon would act like a seesaw on one knife-edge bar. A snaffle or a curb bit is a pressuring device that generates pain or the threat of pain by the application of metal on bone. The bone is thinly covered with gum but has no other ‘cushion.’ At the level of bit pressure the bone is roughly circular in cross-section with a pie-section missing that produces two sharp edges at 11 o’clock and 1 o’clock, the bars of the mouth. In a large horse, such as the one depicted here, the diameter of the section is 45 mm; the same diameter as a standard hen’s egg when cut in half. 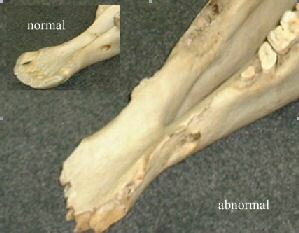 The bone is also as fragile as the simile suggests and should be treated with the same respect. As the bit applies pressure to the top edge of the lower jaw (the bars of the mouth) and the curb chain applies pressure to the bottom edge, the bone and soft tissues are being clamped between two pieces of steel. The bars of the mouth are two knife-edges of bone, covered with only a thin layer of gum and the mucosa of the mouth. Sadly, instead of treating a problem by removing its cause, which is the only valid approach to treatment, the standard approach to these evasions is to employ a variety of supplementary devices aimed at suppressing the symptoms. These devices are designed to prevent a horse from doing those things that it would never think of doing if it did not have a bit in its mouth in the first instance. 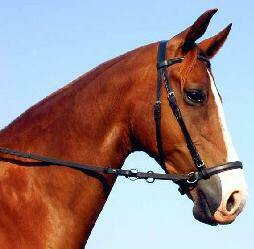 Hence the use of ingenious straps to try and close the mouth, such as dropped nosebands, flash and grackle nosebands. Similarly, in the hope of limiting if not preventing head tossing, standing and running martingales are employed. To discourage evasion of the bit by tongue movement, racehorses have their tongues tied to their lower jaws with either rigid or elastic straps. Predictably, none of these measures are effective cures for the problem. They are not even very effective in suppressing the symptoms. Fig 4 - This is what a horse looks like if one apportions scale and color to represent the relative sensitivity to touch of its various parts. The red areas represent those areas that are most generously supplied with sensory nerves. In such a representation the muzzle and mouth become the largest parts because these are the most ‘touchy/feely’ areas. The horse depends on its muzzle to feel its way around the world. The horse exhibits this pain through the four F’s of fright, flight, fight and facial neuralgia (the headshaking syndrome). Apart from these being the underlying cause of accidents to horse and rider, the bit also interferes with both breathing and striding (Cook 1999a, 1999b, 2000). Shortage of breath is a cause of premature fatigue and, once again, fatigue is a potent source of accidents. Fatigue causes falls and falls can be fatal to man and horse. Finally, fatigue is a common cause of poor performance. The bit method of communication is unacceptable on all three criteria. It might be considered humane in the hands of a master horseman who has learned to avoid its use. But even master horsemen are not born with good hands and so horses will undergo years of pain before a budding master achieves years of discretion. In the hands of an average horseman, a bit is a painful method. In the hands of a novice, a bit method is clearly cruel. Quite apart from the evidence now accumulated that the bit causes pain, the effectiveness of the bit method from the rider’s point of view can be shown to be questionable, simply by noting the multiplicity of bit designs that are on the market. The situation is rather similar to the situation in medicine. Whenever there is a multiplicity of treatments for any one disease or problem it is generally true to say that none of them is entirely satisfactory. Unsurprisingly, the bit method is ineffective in preventing the many bit-induced instances of bolting, bucking and rearing. When it is recognized that all three of these problems are commonly caused by the bit, it becomes apparent that it is illogical to expect such problems to be cured by continuing to use the same method and simply changing the design of the bit.